Sacerdotus: Blogger Esther (Rosa Rubicondior) Agrees to Debate; Will She Run Away Again? Blogger Esther (Rosa Rubicondior) Agrees to Debate; Will She Run Away Again? After running from my previous debate offer on Twitter in 2012 (see: http://www.sacerdotus.com/2012/08/proof-rosa-accepted-debate.html), blogger Rosa Rubicondior whose real name is Esther Harrison (see: http://www.sacerdotus.com/2014/10/case-study-rosa-rubicondior-revealed.html) proposed a new debate which I accepted. I invited her to debate on Sacerdotus Hangouts and she accepted after stating that she will not do it on a site run by me. You Tube is not run by me so there is no excuse for her to run away again. The debate will be live and in real time. There will be no possibility to edit anything. It is a neutral forum. "Rosa Rubicondior" pretends to be an intellectual atheist despite her scientific illiteracy demonstrated on her blog which brought others and myself to form www.rosarubicondior.com which is a site that counters her blog misinformation. 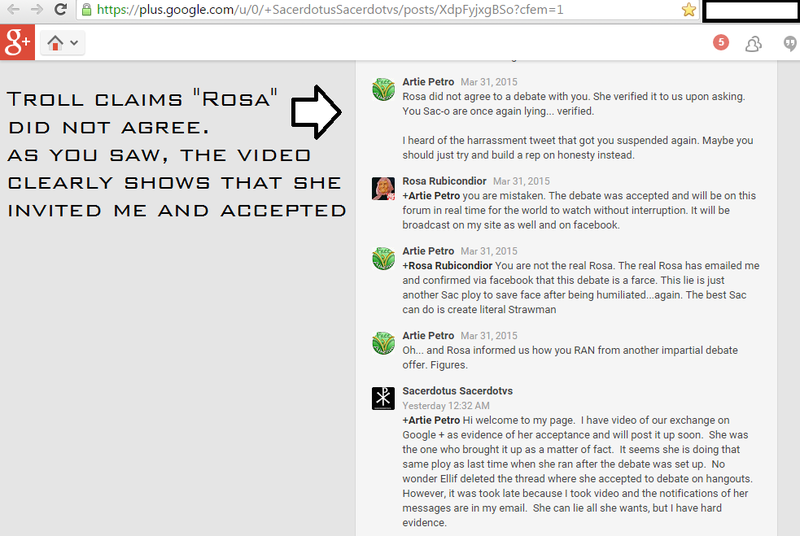 Let see if Esther Harrison aka "Rosa Rubicondior" sticks to her word and shows up. So far, it seems that she is going to run from debating me again as her sock puppet accounts are not trolling the event claiming she did not accept to debate.